Back in 1970 I came for a job interview in Wiltshire. I had no car then and I found that Chippenham was the nearest available station. From there I was given a lift to Devizes for the interview. Regular readers will know of my love of chalk downland, so that car journey absolutely captivated me, for we passed some glorious chalk hills. One in particular stood out. It was steep sided with a clearly earth worked plateau on which a few gaunt trees struggled to survive. This was, I was led to understand, called Oliver’s Camp or Castle. With such a hill so close by, I had to get this job, and I did, beginning what is now a 45 year association with Wiltshire. This photo of Oliver’s Camp dates from 1973. It is a fairly unchanging scene – except with the seasons. This similar picture was taken in 2006. It is amazing how little those gaunt trees have changed in over thirty years. Things would have looked different back on 13th June 1643. 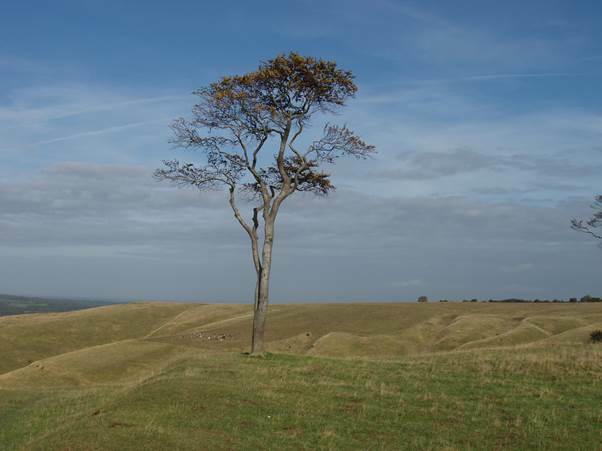 That was when a civil war battle took place in the area – the Battle of Roundway Down. Cromwell’s men had camped on the headland the photos show although Oliver himself was not amongst them. The hill’s name comes from that day. Although it would seem that Cromwell’s men had all the advantages when the King’s men arrived from Oxford, it turned out to be a huge victory for the Royalist side. They won this battle, but in the end, of course, Cromwell won the war. Today what was once a scene of utter carnage is quiet and peaceful. 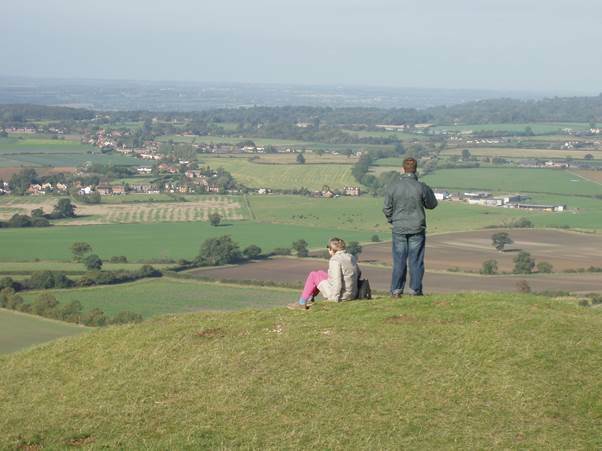 It is wonderful walking country with fine views over the Vale of Avon, the Vale of Pewsey and, with a short walk the vale to the north. Actually, that’s not the real name. It seems to be rather dull in name. It’s a cyclone. I prefer spinneroo. By Heck! It’s nearly February and I’m still thinking about Christmas past. Well, it was only just over a month ago. My son came up with this interesting little gizmo. I don’t know if he was aware that this is an updated version of a toy we used to make for ourselves back in the 1950s out of string and cardboard. You made a suitable disc of card – it needed to be sturdy and coloured it or punched holes in it to taste. You then passed a string through two holes near the centre and made the string into a loop. 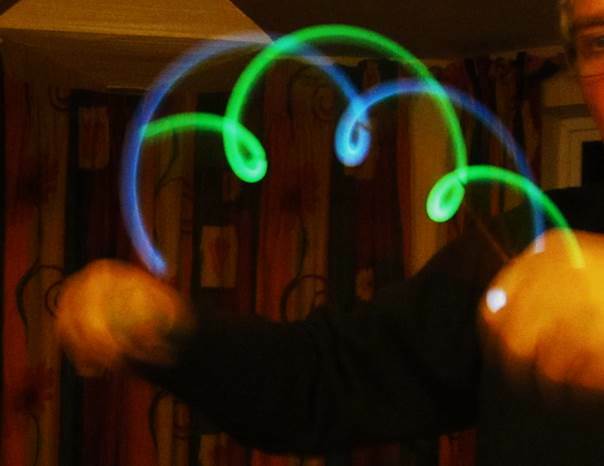 You could then twist up the string and when you pulled – with one end in each hand – you made the disc spin round, fast enough that the colours seemed to merge and the device whirred and possibly whistled as well. 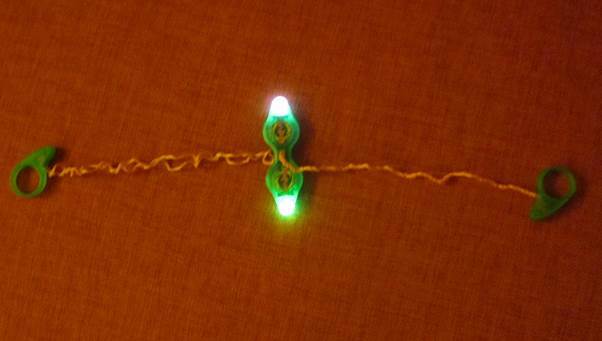 This one is hi-tech and is made of modern strong twine with comfy plastic handles and two lights on the device made to spin. 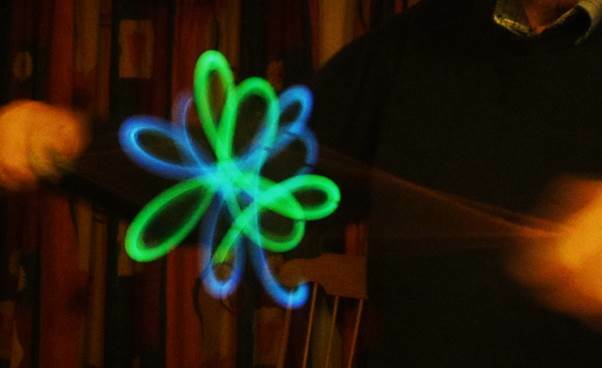 The effect is spectacular, Persistence of vision joins the lights into pretty patterns, according to just how you spin and shake the device. Lucky I have a tripod for the camera. Yes, that’s me. My hands are blurred due to speed of movement and we can see how those two lights, different in colour, appear to chase each other around. Without much practice at all you can get a rather attractive petal pattern. Great fun! Thanks Sid and family. Really I know so little about my Kesby relatives. One of my great grandmothers was born Sarah Jane Kesby. Percy was her youngest brother. Sarah Jane was born in 1874 whereas Percy was born in 1893 which pretty well makes him a generation younger in age. In fact Sarah Jane’s eldest child was born in 1892 – before her baby brother arrived. Percy was born at Tonbridge in Kent which had become the centre of things for what became my mother’s side of the family. He was the youngest of nine children born to Fred kesby and his wife Caroline who had been Caroline Mallion. Percy married Cecelia Barton in 1913. As far as I know the couple had four children of which two (both boys) died in infancy. I believe he had grandchildren born in the 1930s with the surname McIver. And there were more in the 1940s with the surname Norris. The story in the family was that the marriage was not a huge success and that while Percy continued to support and see his wife he actually lived with a lady called Grace. My one picture shows Percy with Grace. Percy died in 1962. His money (£308) was left to his widow Cecelia. What became of Grace? I have no idea. OK folks. There are no real trains in this one – just a board game which is actually called ‘Ticket to Ride (Europe)’. The game was bought for me by my daughter who no doubt thought that a game which might have a train theme would suit me. And it did although, in truth it hardly mattered that it was about building rail routes in competition with others. It just proved to be a really good game – simple to play and with a definite mix of luck, planning and a tad of skill. My wife and I were soon addicted and had taken the game on a camping holiday with us. We had basically been up in Scotland, but on the way home we found our way to a site in Derbyshire where son and future daughter in law were staying. 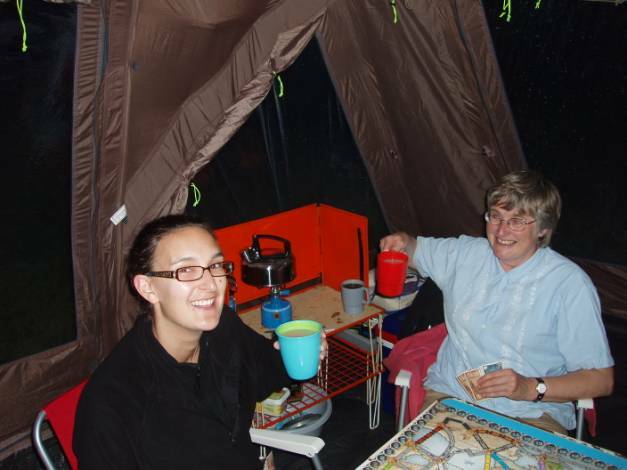 Now future daughter in law was also addicted to the game – more so than us – and for their camping holiday the two of them had actually taken two different versions of the game with them. We always called this game ‘trains’. It seemed snappier and shorter than Ticket to Ride but nobody else would have a clue what we meant if we suggested a game of trains. Well of course, we had a glorious get together in our nice spacious tent and had a four person game of trains. And here’s wife and daughter in law with the corner of the board just visible. As you can see we’ve had a brew up. Mugs of tea are ready. That was a memorable stop for many reasons – really lovely to meet up with the family in remote Derbyshire. Claddaghduff is a small village in Connemara – the west of Ireland. We have been there twice with a forty year separation between visits. 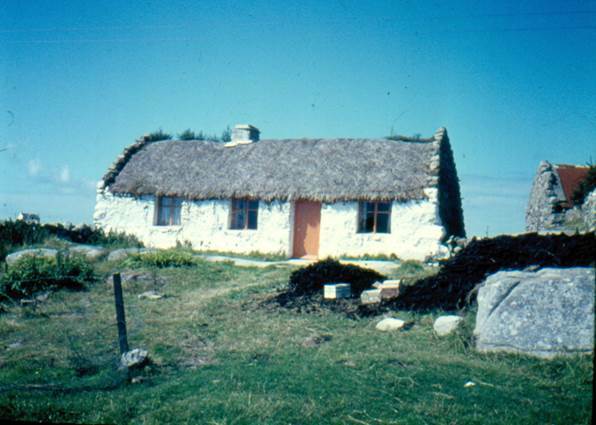 The first visit was in 1971 when I was using my good old Canon Demi camera and I took this photo of what seemed a fairly typical, if rather old style cottage. There’s nothing like a glorious blue sky for making a lovely colour shot and this shows the cottage at its best. It’s a simple, single storey dwelling under a thatched roof. One chimney suggests some kind of a stove on which turf (what peat is always called in Ireland) is burnt. The black heap on the right is that turf. Back in 1971 the modern age was creeping in. Note the barbed wire fence and in the left background an altogether more substantial house, solidly constructed, can be seen. On our 2011 visit I looked for the same cottage but couldn’t find it. 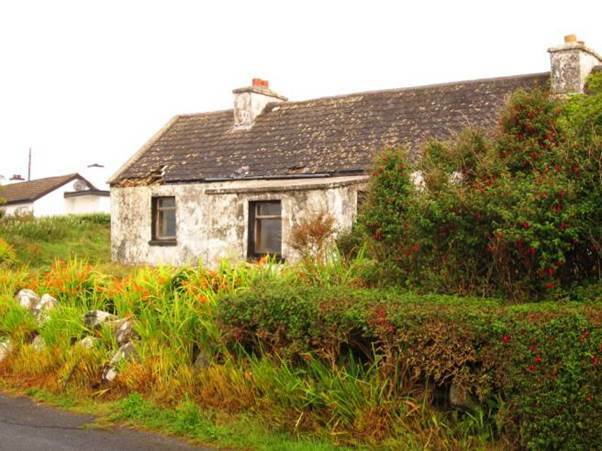 In fact a rather run down cottage was clearly much more modern. And we had no blue sky! Note the montbretia and fuchsias flowering and forming a kind of hedgerow. Connemara has delightful flora. By the way, Claddaghduff is still delightful. The people are as laid back and relaxed as ever. There’s little in the way of rush. It’s wonderful over there. 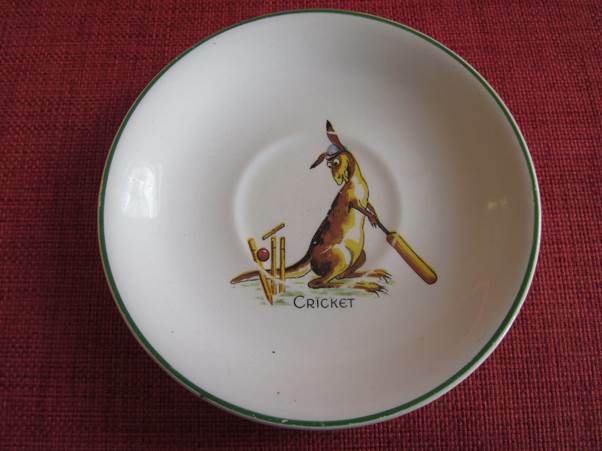 In my post about Old Father Time a few days ago I mentioned that sport wasn’t important in my childhood home and then went on to say how much I remembered the 1956 ashes series. Well who could forget the Old Trafford test match that year when Jim Laker took 19 out of 20 Australian wickets to win the match for England and to create a new word. The Australians were well and truly ‘lakered’! I suspect, but can’t remember, that this little saucer came into the family that year. Well the kangaroo batsman is clearly an Ozzie and he’s turned to see his wicket being broken by what must have been a very clever piece of bowling. It surely must have been produced to commemorate 1956. Whilst I am not certain of the year, I recall very much my own feelings of jealousy for this little saucer was given to my brother. By heck how I wanted one as well. That is, I have to say, the most jealous feeling I think I ever had. And oh so sadly, the saucer has now been mine for ages, for my brother died 35 years ago at such a young age. Let’s look at the maker’s mark on the back. 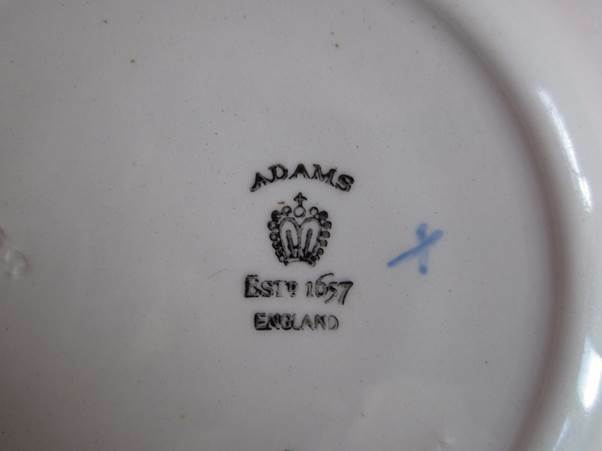 The saucer was produced by Adams who were established in 1657 in England. I can find nothing about this saucer and I’d love to know if my memory is playing tricks. Counting the birds on our plot for one hour a year is something we just do. It is always a bit of a disappointment in that birds we see on a regular basis just don’t turn up in our chosen hour. But this time there were a couple of finches seen that we rarely see although neither would be classed as uncommon. We saw greenfinches and a bullfinch and they don’t often get entered on our return to the RSPB. 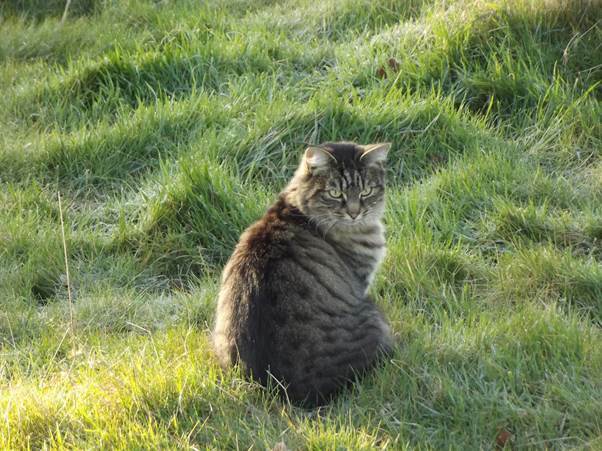 It has to be said that I seem to have a problem when I patrol our area to count the birds. It seems I’m not allowed to do it alone. Our ever friendly cat accompanies me. There he is. Yes, we are lucky and have a pasture field as well as a garden. I got in amongst our fruit trees – often a good spot for birds, but not when this one takes up a dominant perch. 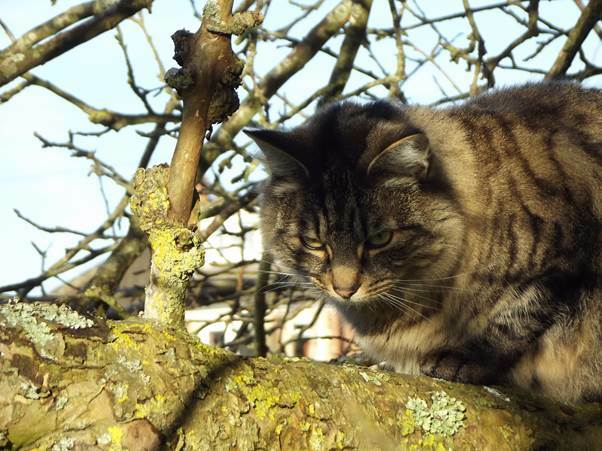 Even in the garden, near the house, an area where I expect to see sparrows by the quite a few, goes quiet as the cat seeks a good vantage point. 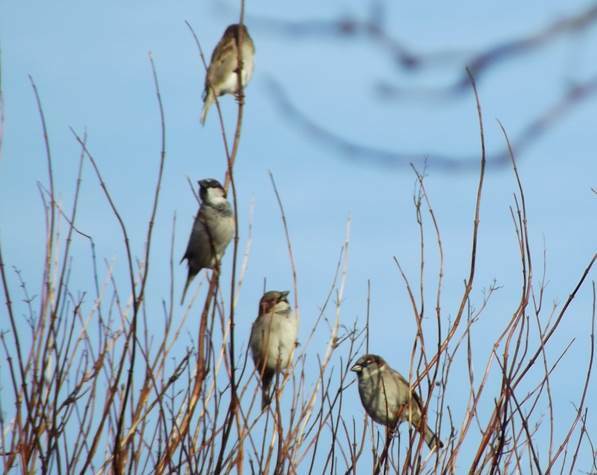 But I did see house sparrows in some quantity. I counted eight of which four got in one photo. 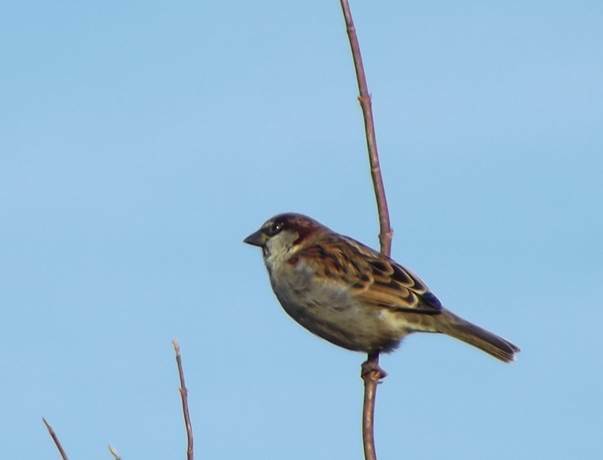 The house sparrow is often a neglected species. They are regarded as dull and ordinary but in truth we are lucky to still see them in numbers. And they do have beauty as well. OK, there are no bold bright colours but the feather markings are still quite striking. It isn’t easy to get photos on a bird count. You need to spot, recognise and record and then turn attention to a camera – by which time the bird has probably moved on. I live in a part of the UK which has, so far, been pretty well snow free this winter. OK, we have had a few flurries, but never (as yet) anything that looked likely to settle. Now circumstances change views. I have a cousin who dreads the white stuff. She has to drive to work and is understandably fearful of the journey. My wife and I are retired and I suppose could say we don’t have to do anything. We could certainly survive without having to use a car – for quite a long while from our own provisions and, assuming roads stayed passable, there is a grocery store, butchers, a chemists shop and a Post Office stores in the village. We could live! So by and large we see snow as a potential source of joy, wonder, and beauty. 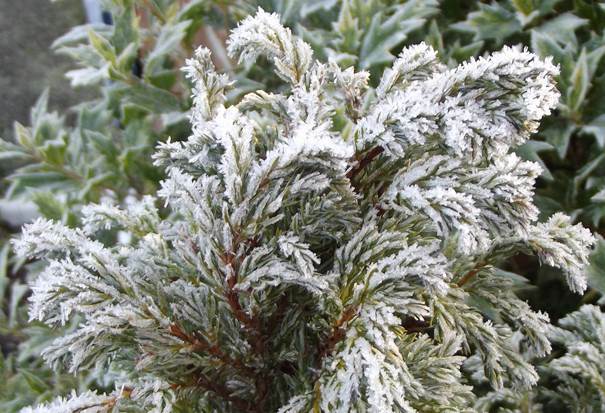 So we feel that as yet we have been denied this, but we have had some wonderful frosty mornings, like the one yesterday (23rd January) when the temperature hovered around the -5 degrees mark until the sun got up. 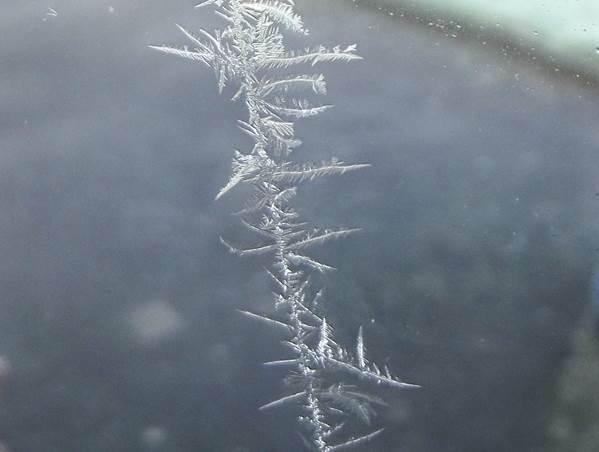 We could start with a line of feathery crystals on the outer porch door. 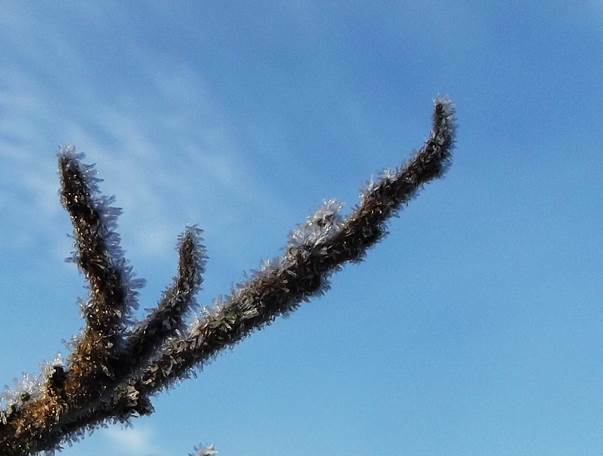 Frost on a winter twig. 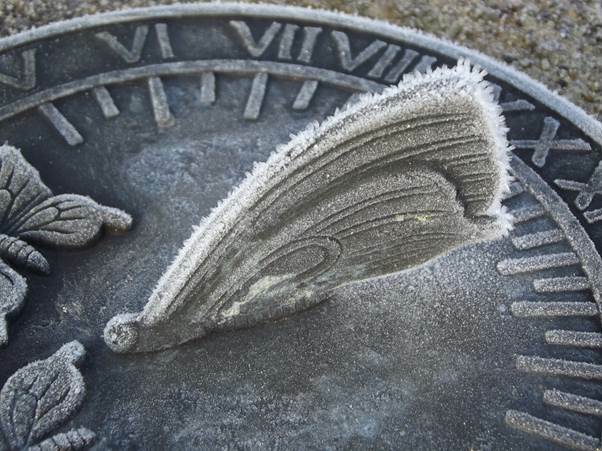 The gnomon on the sundial. Hey! This is my father. 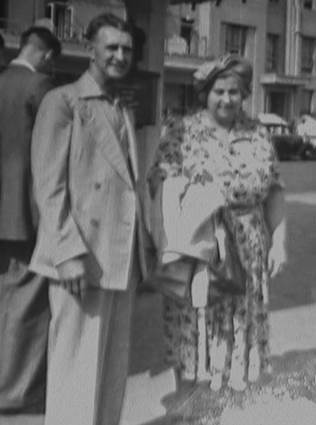 For some event – I don’t remember it – my dad was chosen to be Old Father Time to mark the end of 1953. I’m afraid I don’t know who his young companion is but the event was almost certainly in Ifield in Sussex and who knows – somebody might be able to tell me. 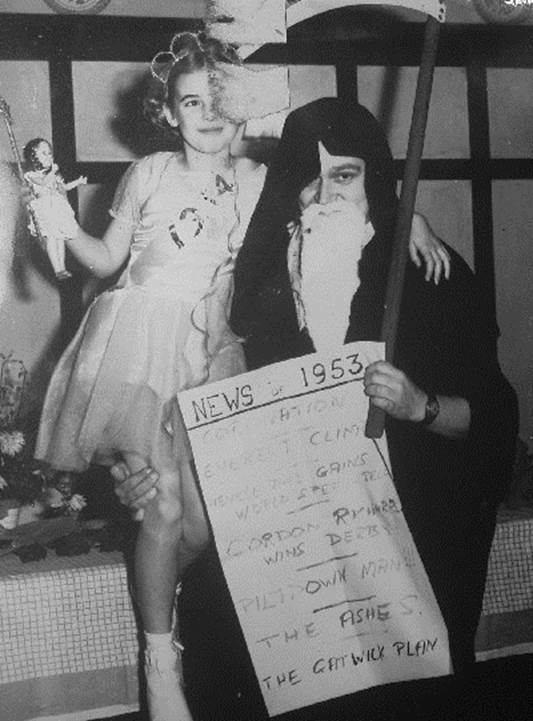 My dad, Harry, looks a bit like the grim reaper with his scythe and face hiding false beard but he carries a poster with news headlines from 1953. 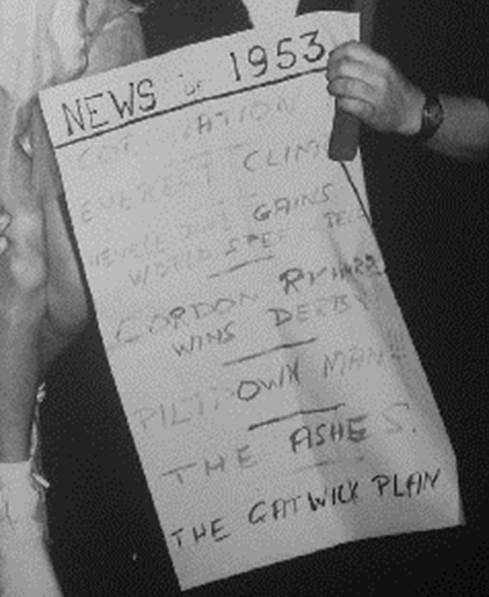 We Have: coronation, Everest climbed, Neville Duke gains world speed record, Gordon Richards wins Derby, Piltdown Man, The Ashes, The Gatwick Plan. This all serves to remind me of my age. I remember some of these events – sport was not that important in my household although I well remember England retaining the ashes in the Jim Laker series of 1956. Do we all see ourselves as quite young? It certainly comes as a bit of a jolt to realise I am remembering events from more than 60 years ago. 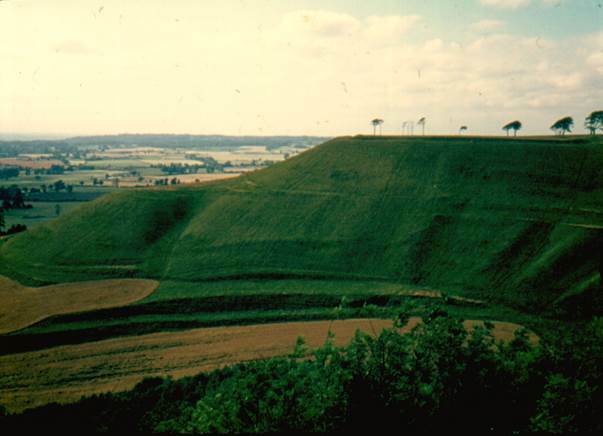 Chalk hill figures have always fascinated me. I think they fascinated my dad. 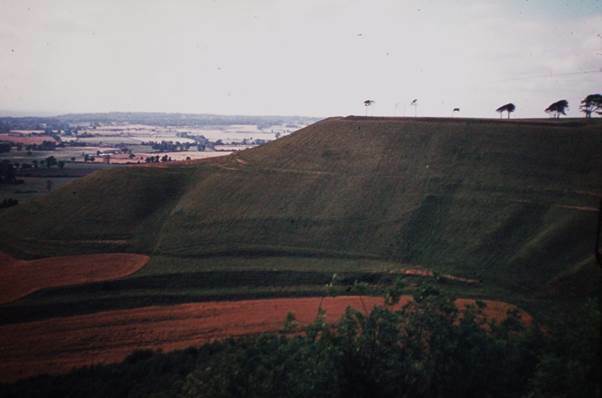 He’d have known the Long Man at Wilmington in Sussex from his childhood and he took us to see it in 1954. 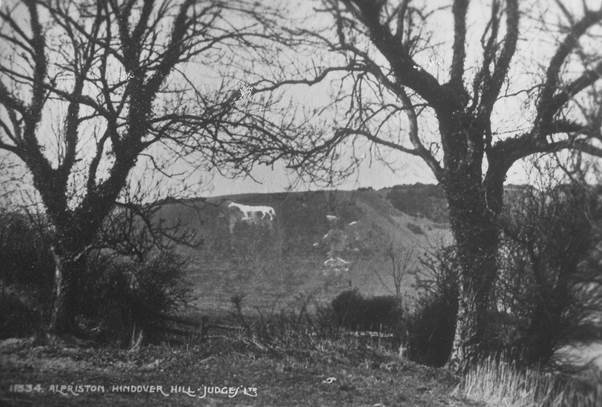 I can’t be certain that we saw the fairly nearby horse carved on Hindover Hill, also known as High and Over. 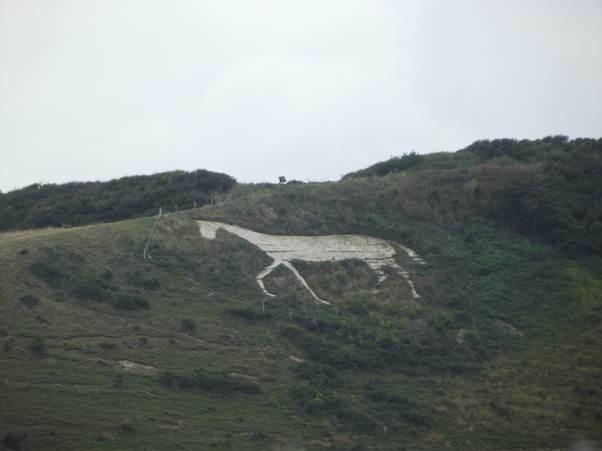 Photography wasn’t cheap in 1954 and Mum and Dad bought a set of small sized postcards in and around the Alfriston area and one depicts this white horse. Back in 1954 an expedition from camp meant cycling and this horse was quite some way away. I know we visited after the arrival of a car which was in 1959. And my wife and I visited in 2014 as we drove from visiting the Peggy Angus exhibition at the Towner Gallery in Eastbourne towards my rendezvous with the old family camp site. This is the photo I took just last September – 60 years after we may have visited in 1954. This particular horse, like most of them, has no antiquity. It was cut in the 19th century although there may have been an earlier figure on this site near the village of Littlington. Figures like these fade away if not cleaned (scoured is the word used) at least every seven years. This one needs attention soon.